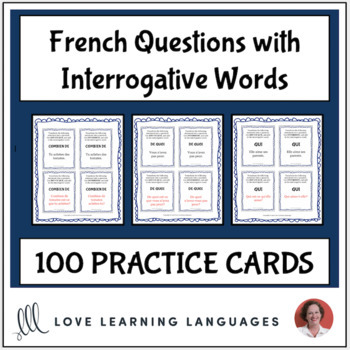 This is a set of 100 cards for practicing forming French questions using est-ce que and inversion. 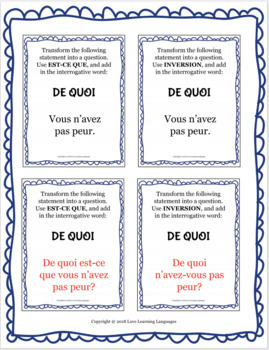 All of the cards prompt students to transform a sentence into a question using an interrogative word: qui, que, quand, où, comment, pourquoi, à quelle heure, combien de, de quoi, avec qui, à qui. ➯ This resource is part of my Ça y est, je parle français! French 1 curriculum bundle! All of the cards are written in the present tense, and some include negation. 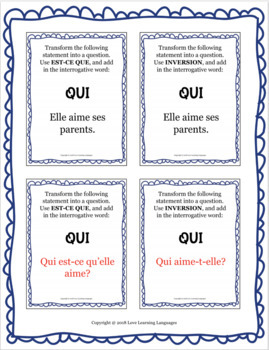 Here are the verbs used in this set of practice cards: aimer, préférer, aller, commencer, apprendre, regarder, acheter, avoir, partir, faire, manger, finir, vouloir, parler, étudier, savoir, déjeuner, adorer, travailler, appeler, être, prendre, donner, arriver, et ranger. Most of the time I like to have my students work in pairs or small groups when using these cards, but they are also effective as individual practice. I also like to project these cards and use them as a whole class activity. I've included a PDF version so that you can project one card at a time or have students use them on tablets to avoid printing. Answer key is provided. 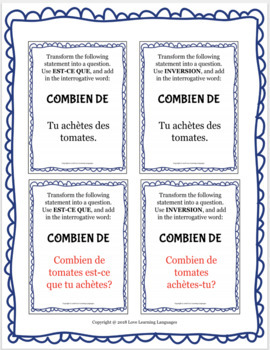 Have a look at my other FRENCH QUESTIONS resources. ☞Just click here to follow my store!